I would love it if you can use this pose (exclude the background & the words) for the both of us as this is our best picture ever. For the clothing, both will be wearing our nursing uniform. I hope you get the rough idea on how it looks. Males wear a shirt with pockets like the female’s and plain white pants. You don’t have to draw the name tag. We both wear plain black shoes. As for the heading (which is placed at the top), it is inspired from a company where we used to work together as a part timer where we first met. My guardian angel is a song title of a song we both like. Can you draw him a muscular arm? Cause he’s really into body building. ....."
Like a very long brief, at my first look. After reading through it, the client is actually trying to give me a more detail brief. i would like to thank you for the caricature. sorry i didn't give any reaction that day. 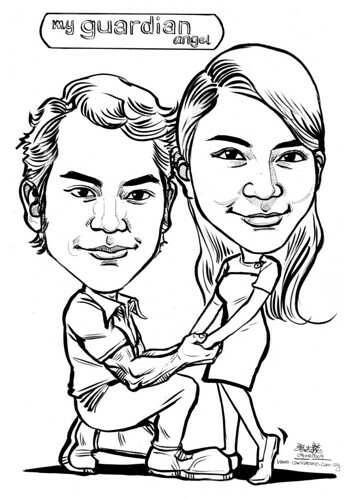 i was kinda shock to see my caricature. didnt expect an A3 size to be so big haha. Thanks for my guardian angel caricature!! and my bf said it really look like us. oh btw i tink you forgot to enter our names and wristband for him, but its ok.
will ask you to draw again in future, for sure!